Kelsie Young is part of the Mi’kmaq Nation and was previously a member of the Qalipu Mi’kmaq First Nations Band of Newfoundland, Canada. 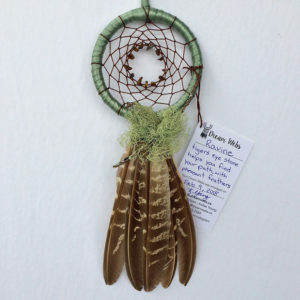 She learned the traditional art of basket weaving, of weaving dream catchers and wooden flower making from a Chief from the Bear River First Nations in Nova Scotia, Canada. Kelsie has a passion for art and business. 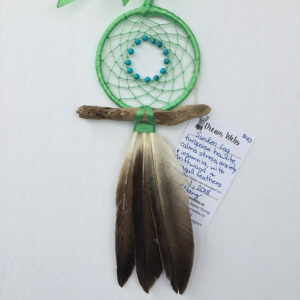 She spends her days weaving dream catchers, teaching private yoga practices, leading smudging ceremonies and workshops, and helping new businesses with marketing, social media and web design. 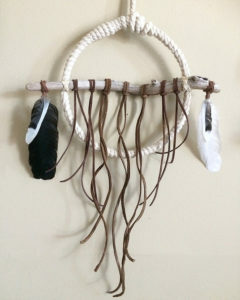 She has been making dream catchers for over 3 years and became a Yoga Alliance certified teacher in January 2017. 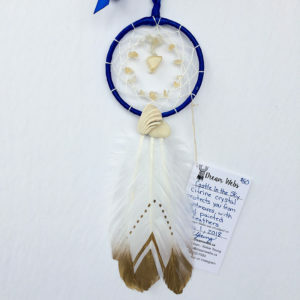 Dream Webs authentic, Mi’kmaq dream catchers are ceremoniously smudged at sunrise to cleanse away negative energy and invigorate them with positivity and light. 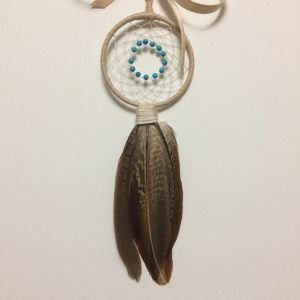 This prepares the dream catcher to protect you as you sleep. 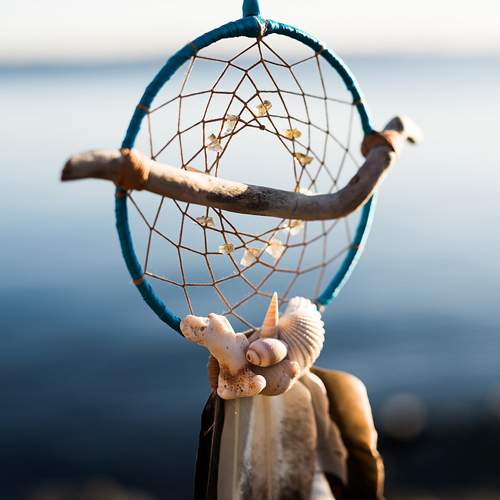 Using the healing powers of semi-precious gemstones, Dream Webs can help mend specific concerns dealing with mind, body and soul. 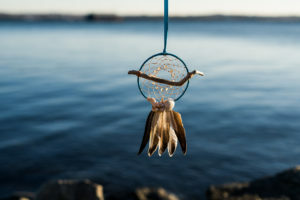 From insomnia, night terrors, stress & anxiety, to protection, well-being, and financial prosperity; there’s a healing stone to help bring your mind, body and soul into balance. 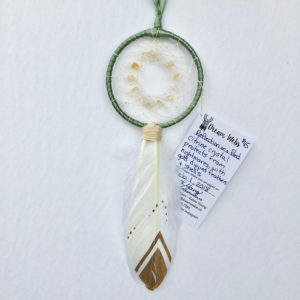 Each Dream Webs is labeled with its semi-precious stones and their properties as well as the date it was smudged on. 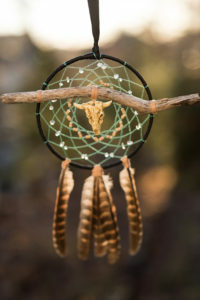 The legend of the dream catcher is an important part of almost all the aboriginal nations of Turtle Island (The Americas). 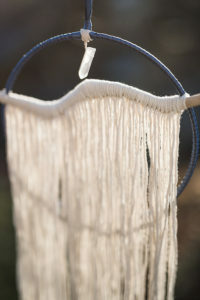 The legend says that the spider, as a thank-you to Mother Earth for her protection, shared his gift of weaving. This is the traditional 12 point circle weave. 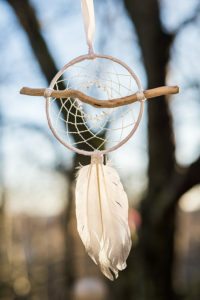 “Watch and learn, for the web will snare all your bad dreams and good dreams will float through the centre. As the sun rises, the bad dreams will be cleansed away by the rays of light. 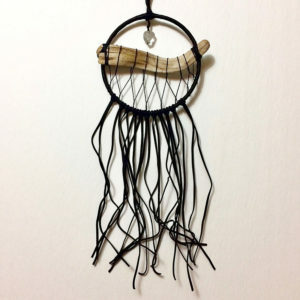 Hang your Dream Webs in the window closest to your bed; that’s where your dreams enter your home.